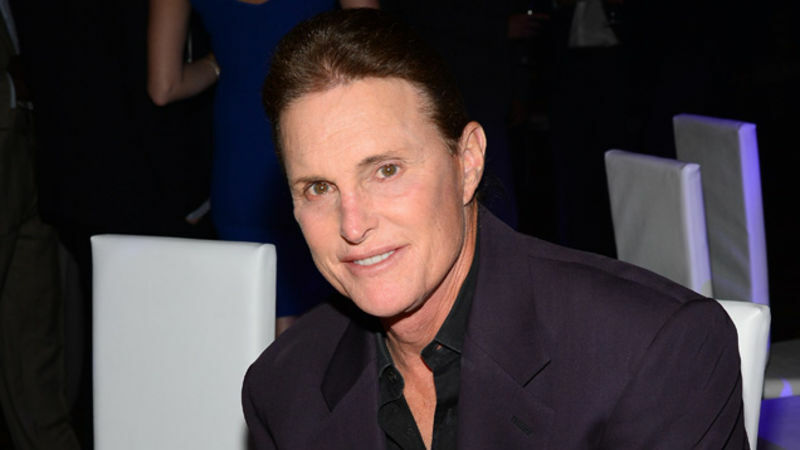 According to a new report from People magazine, Bruce Jenner will appear on the cover of an upcoming issue of Vanity Fair as “Her,” the name the former Olympian has used for his female identity. Five months ago, Vogue released a pictorial featuring none other than Adam Driver, one of the stars of Girls. The images were, all in all, quite nice. He wore a live sheep around his shoulders and looked fantastic. As if Vogue would have it any other way. 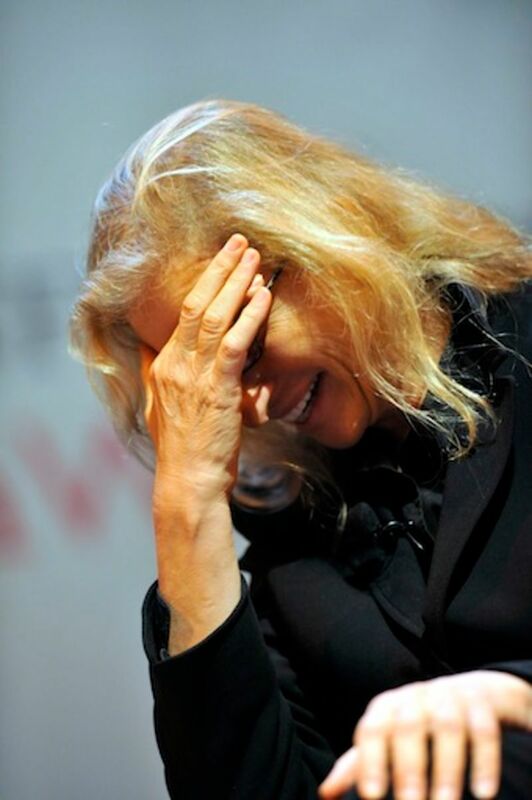 The Mystery of Annie Leibovitz's Economic Collapse Solved: Nobody Likes Her Pictures! The Financial Times' John Gapper weighs in with a new and elegant solution to the riddle that is deadbeat photographer Annie Leibovitz's descent into insolvency: Rich art collectors have no interest in buying her photographs, because they're not that good. Did Jesse James turn Sandra Bullock into a lesbian? Or was it Scarlett Johansson's singular hotness? Gary Coleman death photos for sale. Lindsay Lohan explores exciting new ways to hide her SCRAM bracelet. Monday gossip is the best revenge. Ken Starr, Bernie Madoff to the Stars! 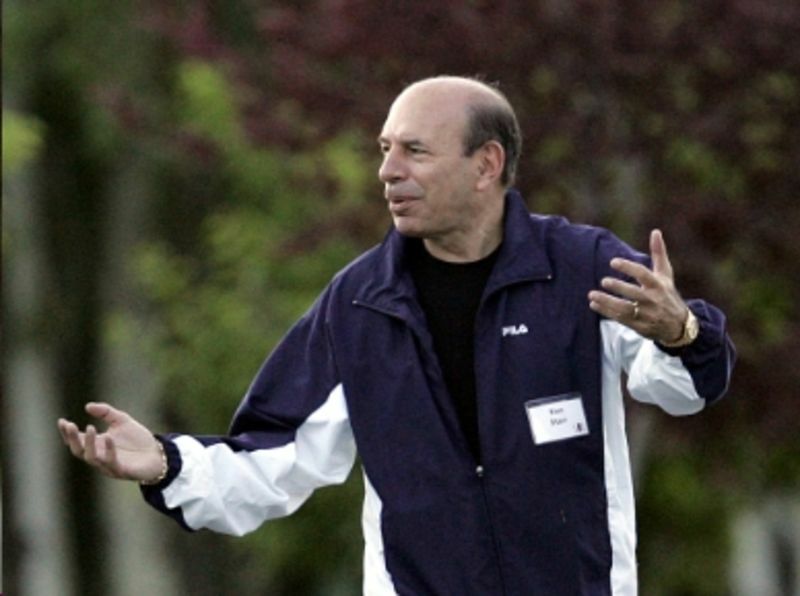 He's been charged with running a Ponzi scheme using money from celebrities. One of them is reported to be Uma Thurman. Dude, didn't you see Kill Bill? You're dead meat! It's Tuesday, which means there's another creditor going after nearly bankrupt photographer Annie Leibovitz. As we mentioned earlier, Brunswick Capital says Leibovitz refused to pay $800,000 for helping her land financing to keep her solvent. We have the complaint. 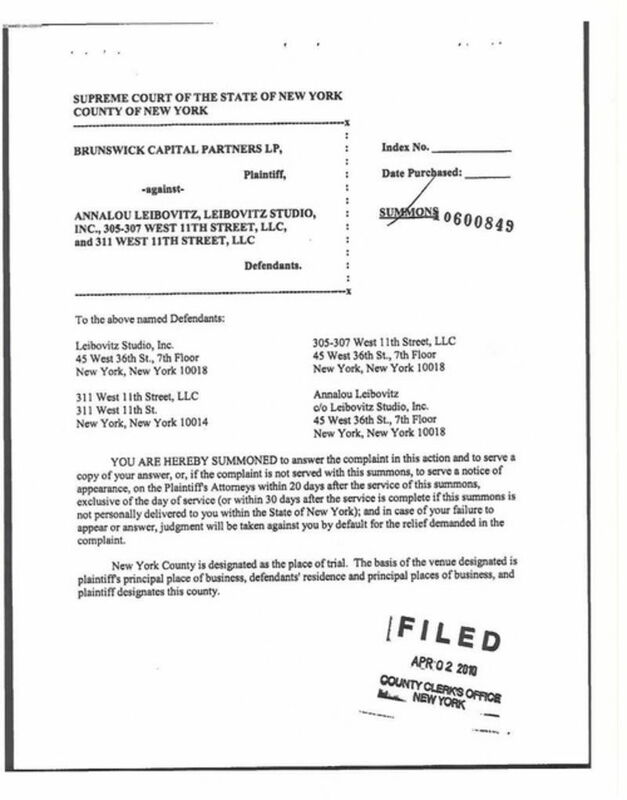 Brunswick Capital filed this complaint against Annie Leibovitz in New York Supreme Court last week claiming Leibovitz owes the firm more than $800,000. 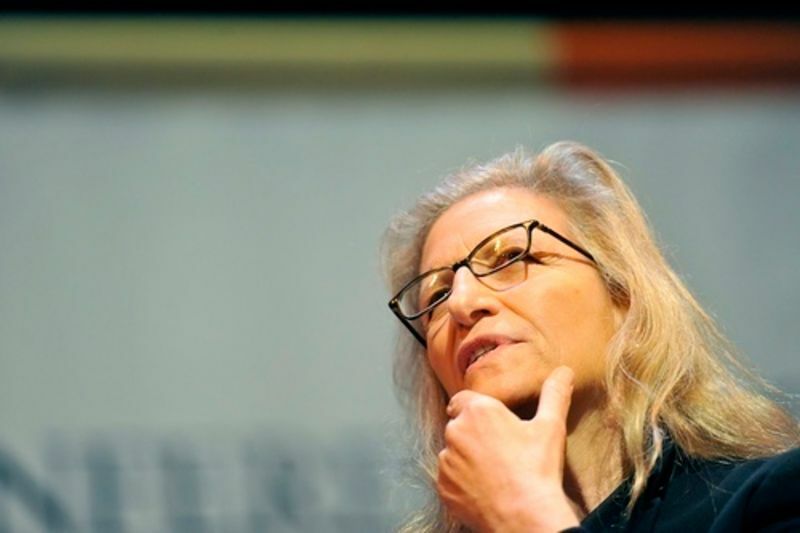 Deadbeat celebrity photographer Annie Leibovitz has a new debt collector to hide from: Art Capital Group, the artsharking operation to which Leibovitz had mortgaged her homes and photographs, has sold the debt to Colony Capital. But Celebrity Photo Shoots Always Look So Fun! Annie Leibovitz's flirtation with bankruptcy apparently hasn't made her any easier to work with. Do You Remember the Bills You Have to Pay? 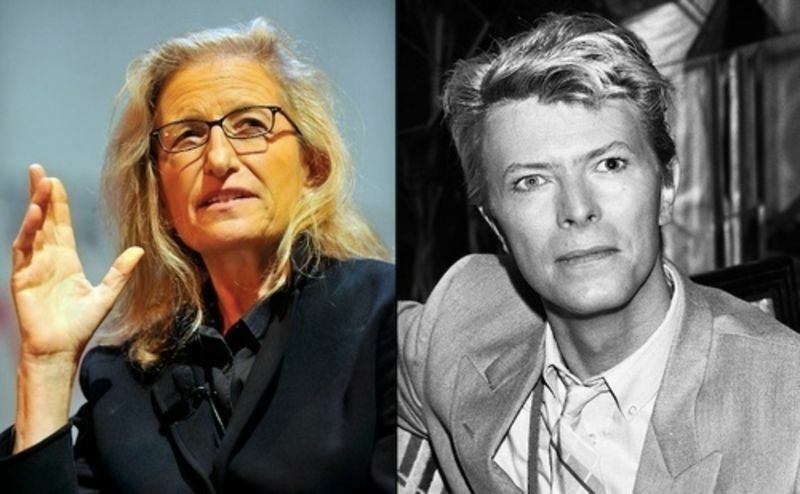 The New York Daily News reported over the weekend that none other than David Bowie may be coming to financially strapped celebrity photographer Annie Leibovitz's rescue by buying her Rhinebeck, N.Y. estate. • Word has it Conan O'Brien and NBC have finally reached a deal. He'll leave with $25-30 million and could end up joining Fox eventually, although a deal is far from certain. As for NBC, fallout from the mess is expected to linger for a long time. And now Jimmy Fallon is the The Tonight Show's heir apparent. • Cable spats: Fox and Time Warner reached a deal in their dispute on Friday. But Cablevision customers are still without the Food Network and HGTV. 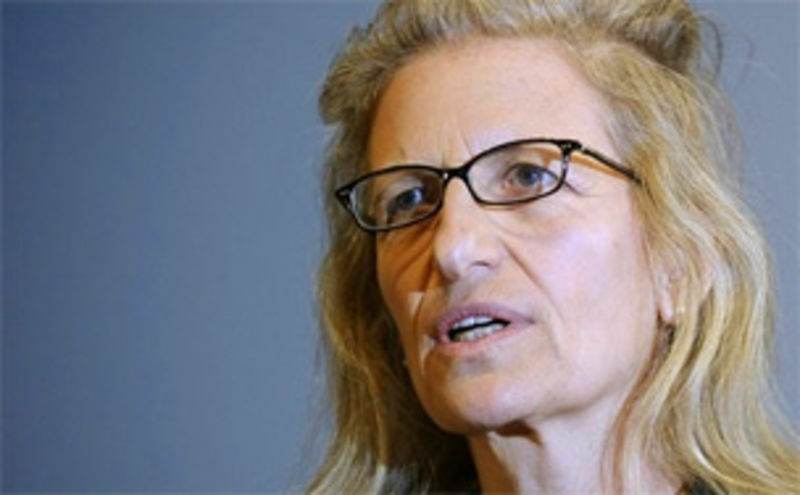 Back in September, Annie Leibovitz "settled" her debilitating debt issues with high-class pawnbroker Art Capital Group. How'd she pull if off? By borrowing $6 million more from them. Photographer Annie Leibovitz came close to losing everything this past fall when she was sued for failing to pay back the $24 million loan that had been extended to her by Art Capital, which had taken her real estate holdings and the rights to her photos as collateral. Leibovitz managed to avert crisis when she reached a settlement with the firm at the last minute. But she's not out of the woods yet. The Times reports today that as part of the deal, she now owes Art Capital $30 million, and she'll have to pay it back in full by next summer. Leibovitz has been looking to raise cash to pay off the debt in recent months. She's selling limited-edition prints and has been in discussions to write another book. She's also looked into offering bonds backed by her future earnings, something that David Bowie did a few years back. But it's unlikely those efforts will raise the millions she needs and chances are she'll need to take resort to more drastic measures over the coming months. What could that entail? A glimpse of Annie's future after the jump! 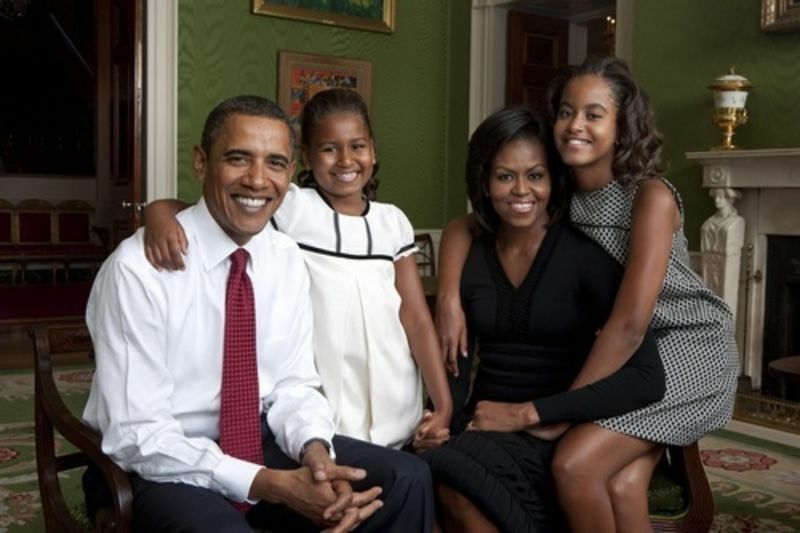 The White House has released the official Obama family portrait, which was taken by Annie Leibovitz. What do you think that gig pays?